This weekend was one of my most challenging but fun events of the season – the 24 hrs of Adrenalin. Basically, teams race around a narly 14 km loop around the Canmore Nordic Centre and who ever completes the most laps in a 24 hr perisod wins. Me…I entered the solo category…call me crazy. The start was pretty cool. It was a Lemans start which means we had to go for a nice 500 m run before we could hop on our bikes and hit the trails. Naked Jon (my pit buddy) ran the start wearing his trusty sombraro…it really added to the ambiance of the event. That and the guy who rode solo dressed as Santa Claus (for the hole race). So many people were cheering so loud and ringing their cow bells ’till, the cows came home I guess! The field at this events are a big mixed bag of fitness level, MTB skill, and endurance base ranging from the odd AB Cup racer to some who you would not believe were riding their bikes up these hills. It was kind of a nice change from the stress of “serious” racing. Extra special for the event was the number plates as every solo rider had a front and back # plate for your bike with our first names on it. That was all the fans and all the other competitors could give us an extra cheer. I must say, it was awesome. Now, usually when someone says “Good Job Mike” I try to say thankyou (if I’m not breathing too hard) but at the race this weekend it was impossible to say “thanks” to everyone who cheered, me specifically, on. Wow, that was a great feeling. A special mention has to go to “Crazy Larry” – the guy who was on the blow horn, all night, in the timing tent who went nuts everytime me or another solo rider came thru. No matter how tired my legs were I always had an extra pop in my legs after high-fiving Larry. So my racing experience was just that, an experience. 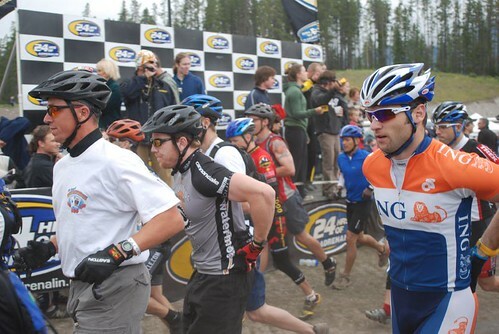 At the end of the event I completed 9 laps – 126 kms of off road. I think the winner did 21 or 22 and looked like a zombie to boot. I know my body’s limits and I knew it was best to shut it down after 9 hrs of riding, get some sleep, and not wreck my knees or any other important part of my body. I went into the event with the aim to have fun and thanks to the people I was with I hit my target bang on. Props to Naked Jon, Trevor “I seem to suffer with a smile” Pombert, and Rockin’ Rad Hair Roger for pumpin’ out all those laps with extreme dedication. Special thanks to my ad hoc pit crue of Eric, Chris, Shannon, Leah, Auzzie Dude, Shannon’s Friend, and to my bro and his girl for driving me home. You guys made it a memorable experience. This weekend was packed full of bike racing and bed lounging for me. Saturday was the MTB provincial XC where I had excellent legs. My tire selection was a gamble and they were super fast tires for 90% of the course but unfortunately the other 10% of the course (muddy and wet) made me revert to riding like a small child – where I lost oodles of time to my competitors. The gamble didn’t quite pay off but at least it was nice to see the front of the race for 1 hr anyways. 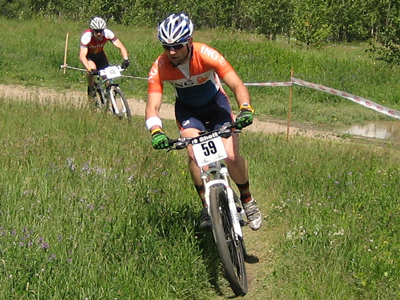 I was very happy to see my good friend Evan suffer face his way to win the race and claim the provincial title. He will look mighty special in the white & blue strips next year – Congrats Evan! The Canada Day Crit was yesterday and Brys & 9 months pregnant Angie we out among other friends (Liesje of course, Jay & Julie) cheering me on and Brys snapped some nice photos. Thanks Brys! Once the 7 man break got away I stayed at or near the front of the pack and stayed out of trouble (away from crashing that is – unfortunately Evan was unable to avoid that dreaded crash, but he’s okay). The group was not very motivated to chase down the leaders so it was a pretty mello race. 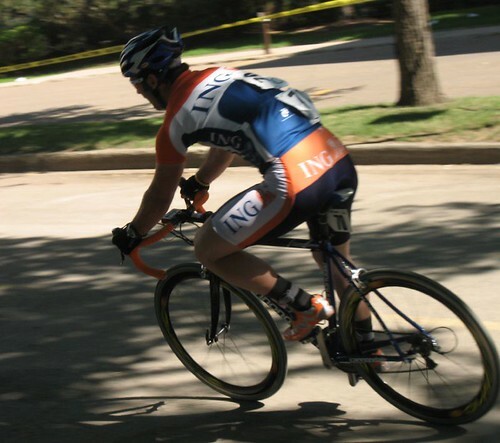 For what it is worth, I sprinted into 3rd at the finish from this main “chase” group just behind 2 whiley vetrans. Nice to see that Marc Bomhof won w/ Hopping taking 4th. Today was all about the lounge factor. I got up early and laid on the couch. Ate some breakfast, walked the dogs, did some shopping w/ Liesje, had some Tokyo, then went back to the park and laid down again on my nifty new ING picnic blanket.